Oh... riiiiiight... I'm a painter. 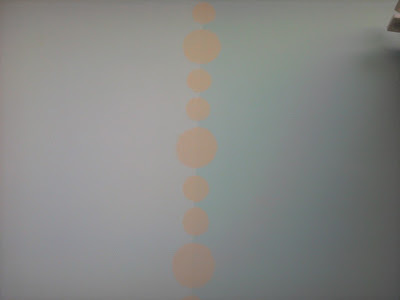 I almost forgot to blog about painting. OK, enough about the romantic, creative stuff or the spiritual journey... let's come back to Earth and talk about a recent paint project. There are some jobs that present "modern problems." I have nicknamed them such, because architects and builders of today use very different solutions to maximize space and build profitably. Some homes have unique wall breaks, larger rooms with different ceiling heights, random soffits here and there, open staircases, two or three storey foyers, and my personal favorite, the "main wall" that runs from the front door all the way to the kitchen in the back of the house without stopping. Clients often call me for a solution on how to paint these "modern problems." Where does one room end and the other begin? What is the ceiling? What is considered the "wall?" The answers are as unique as the situations, and no two are alike. One recent example was "Miss Avery's Room," a little girl's bedroom on the third floor of a home located in a beachy suburb outside of NYC. 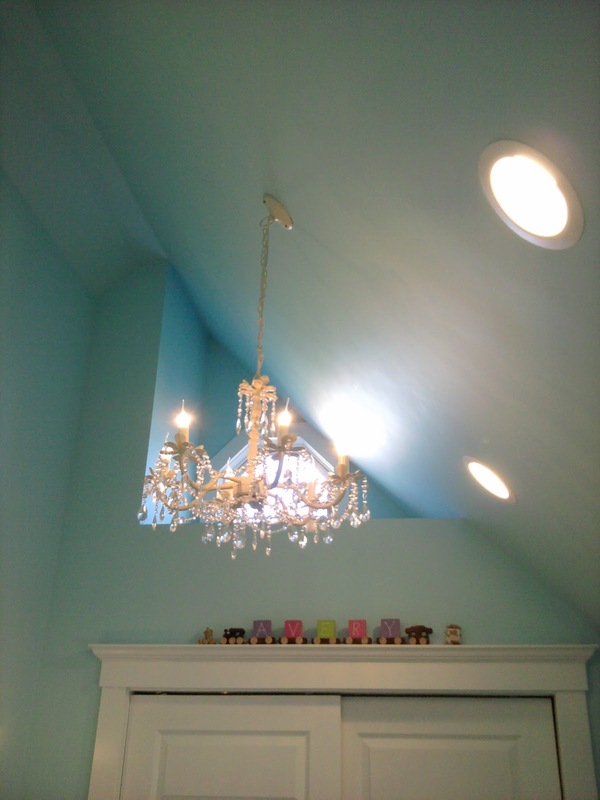 While renovating, Miss Avery's parents maximized all available space in what was originally the third floor attic. Miss Avery's room, as a result of this, had some really unique walls angles and slopes. Upon my first visit, I could plainly see how the average homeowner would have no idea where the walls ended and ceilings began. 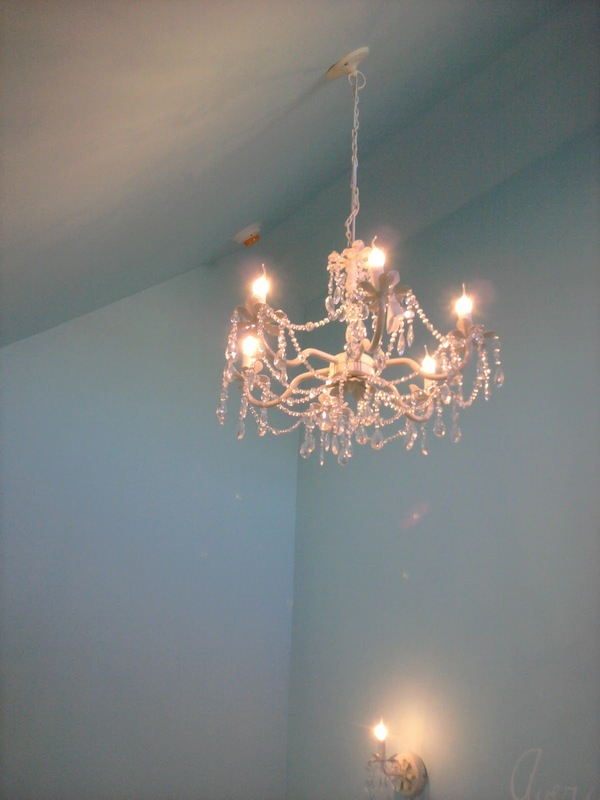 As a remedy, I suggested we paint the entire space above 30" a pale aqua blue (inspired by the world famous Tiffany box). Blue tends to be a very transcending color. 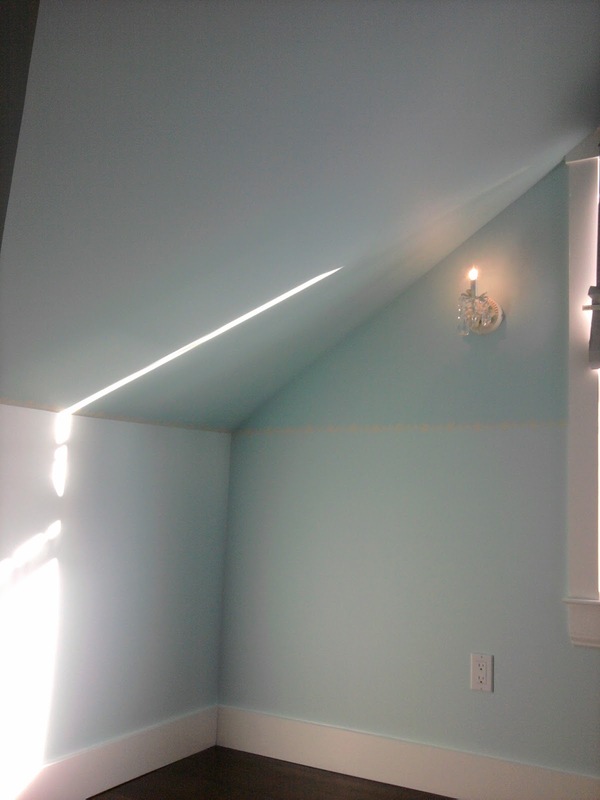 It works well when you desire the ceiling to "disappear." I custom made a second "off-spring" shade of blue by adding 30% Super White to the original color, thereby lightening it about 3/4 of a shade. This was applied to the lower wall, all of the space below 30" of height. 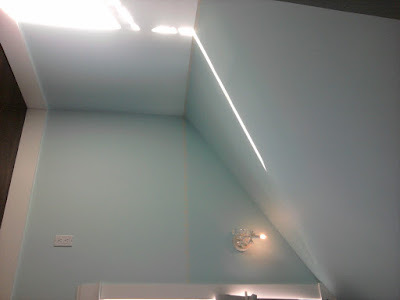 Look at this dramatic wall/ceiling slope! 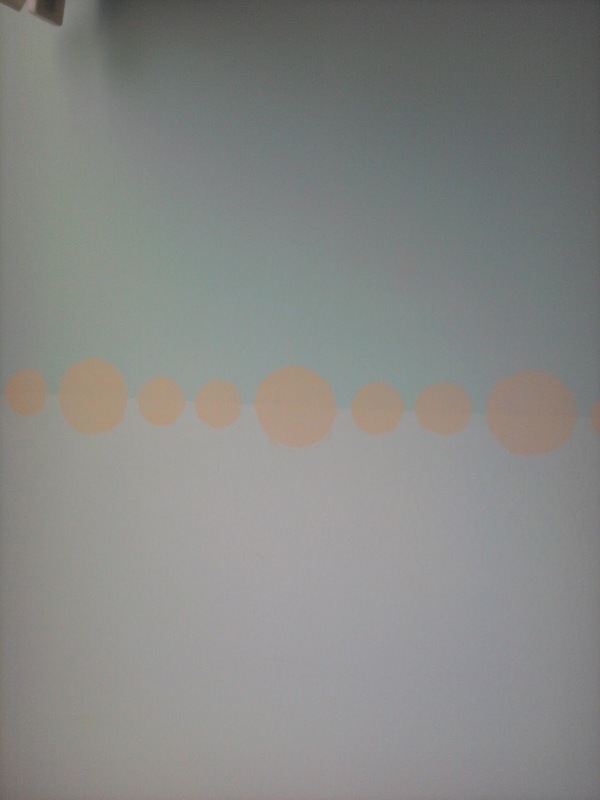 I then defined the two closely related blues by creating and applying a custom cut stencil of polka dots around the circumference. This "circular shape" border does double duty by simultaneously anchoring you in the angled room and softening the hard lines of the space. stayed true to that line height all around the room. As a finishing touch, the very talented Jenn Danza added a hand-painted monogram-type personalization to the room with the addition of Avery's name above the crib. of the other elements were in place. and progress with Miss Avery's mom who works in Manhattan. Modern Problems and Modern Solutions! The results were lovely and the clients were thrilled. Sweet dreams, Miss Avery... may you enjoy many happy memories in your new room! 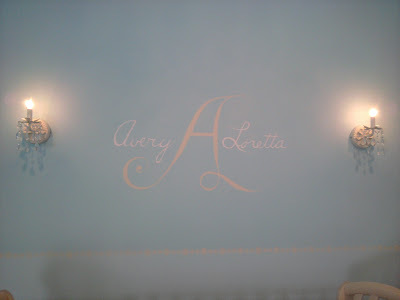 Nice job, love the monogram Angela!! Those were two of my favorite jobs with Divine Rooms. 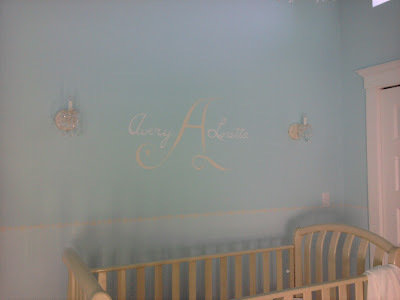 Btw, I had a GREAT shot of you all squeezed in the one cubby space of Avery's room painting but deleted it by accident. I should have sent it over. Wow, y'all did such a great job! Painting seems like it would be fun to do as work, but I bet it takes a lot of work. I've never been much of an artist, so I should just quit dreaming of that career path right now. Enjoy looking at your blog! Hope you have a good week. Beautiful! I wish I had as much space to play with in our house! 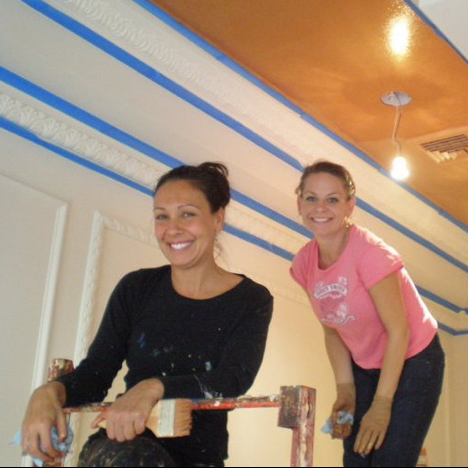 Angela-what a great room and color choice. Thanks so much for leaving me some encouragement on my blog. I love that you share about your business and a behind the scenes type look for your readers. I've subscribed to your RSS feed, can't wait to read more. Thank you, everyone! So much fun to be able to "Show and Tell." Thanks for this very inspiring article. 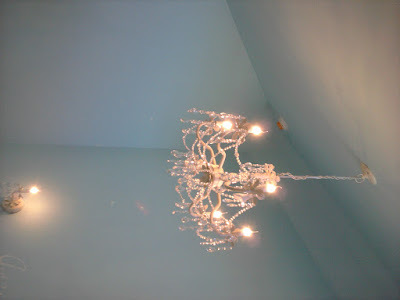 I'm thinking about some redesign in my home with paint, mostly in the master bedroom. This will just be a decorative detail paint job and will probably happen during my spring cleaning fling! By the way, I love the Tiffany Blue Box reference. 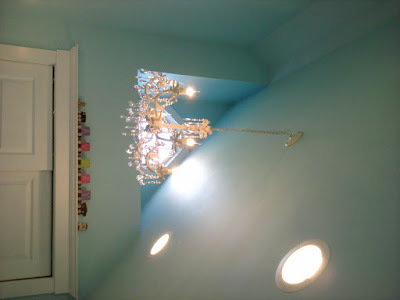 I loooove the Tiffancy Blue Box in general.